30 minutes. Headphones recommended. Eyes open or closed. Nor suitable for looping. Includes full usage guide. This session helps you switch off your “everyday” head and really let your hair down. Enjoy the buzz, energy and excitement of a night out in the noisiest, busiest bars and clubs. When you’re “tuned in” to having fun, you’ll really soak up the atmosphere and be able to enjoy yourself to the max. Enjoy the travelling sounds as you make your way to the night’s event. Close your eyes and relax for the first few minutes (10Hz), then let yourself be lifted out of the day and into the night (13Hz & 20Hz). Includes a gentle acoustic massage which will improve the ear’s ability to respond safely to loud noises – you will probably feel a slight hearing loss after listening – but your ears will thank you if you’re off to a noisy venue. This track is ideal for use on public transport. But please DO NOT use while driving. For full details, download the user guide. 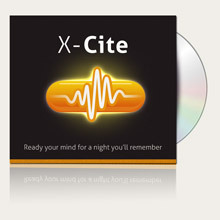 Special offer MP3 price: JUST $14.95! Buy the MP3 version! Instant MP3 delivery. Single cost of: $14.95!